Could You Suffer From Seasonal Depression? Season depression, also known as seasonal affective disorder (SAD), is a form of depression related to the seasons of the year. According to Mental Health America, season depression occurs around the same time every year – beginning in the Fall and continuing through the Winter. There are some cases of seasonal depression happening in the Summer and Spring, but this instance is not as common. Who is affected by seasonal depression? Within any given year, up to five percent of the United States population will experience seasonal depression. In that population, four out of five people affected are women. The disorder commonly occurs between 20 and 30 years of age, but it can appear earlier. International trends show that the further the location from the equator, the greater the risk of someone suffering from seasonal depression. Symptoms of seasonal depression are often hard to decipher from other forms of depression. However, carbohydrate cravings, increased appetites, excessive sleepiness and weight gain are more common in seasonal depression. A doctor can give a diagnosis after two consecutive instances that begin and end the same time every year, with the symptoms disappearing afterwards. Other specific systems of SAD are: depression, anxiety, mood changes, sleep problems, lethargy, overeating, social problems and sexual problems. Mental Health America explains that reduced light levels and shorter light periods are causes of this depression. With this lack of sufficient light, serotonin, a neurotransmitter that stabilizes your mood, is lessened. Lower serotonin levels are often linked with depression. During this time, there is also an increase in melatonin, a hormone that helps you sleep. Melatonin levels increase in the dark, which will affect your circadian rhythm, or ‘biological clock.’ This means it messes with your sleep/wake cycle, which produces seasonal depression symptoms. The treatments for SAD aren’t too complicated. 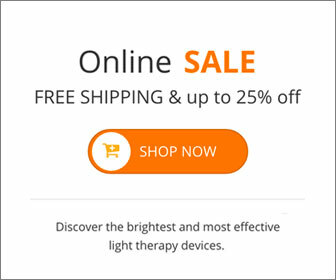 Phototherapy, or bright light therapy, has shown some success in lowering melatonin levels, and although there is little to no research findings that give a definitive answer, light therapy has been shown to be effective for up to 85 percent of SAD cases. If light therapy doesn’t work, antidepressants are often prescribed, which help reduce or eliminate symptoms, although they do have side effects to consider. Always discuss this with your doctor. It’s not hard to help prevent seasonal depression. Since the pattern is fairly predictable, get started on preventative measures in the Fall before your symptoms appear. Begin light therapy, exercise more, increase the amount of light in your home, meditate, implement stress management methods, spend more time outside or visit climates with more sun. This entry was posted on Tuesday, February 28th, 2017 at 9:30 am	and is filed under Depression, Light Therapy, SAD. You can follow any responses to this entry through the RSS 2.0 feed.